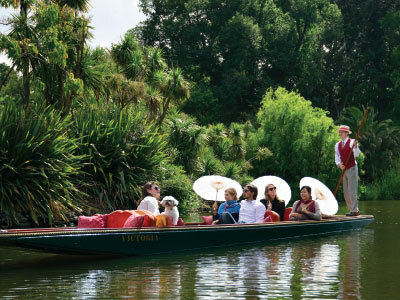 Visit the beautiful Botanic Gardens and experience a relaxing punt ride on Ornamental Lake. Continue to the trendy bayside suburbs of St Kilda and Brighton with time for afternoon tea and take photos of the iconic bathing boxes. Your "punter" in period dress, propels your boat and provides commentary on the area's history, environment, wildlife and plants - a unique experience in Melbourne! Albert Park Lake - site of the Formula One Grand Prix.